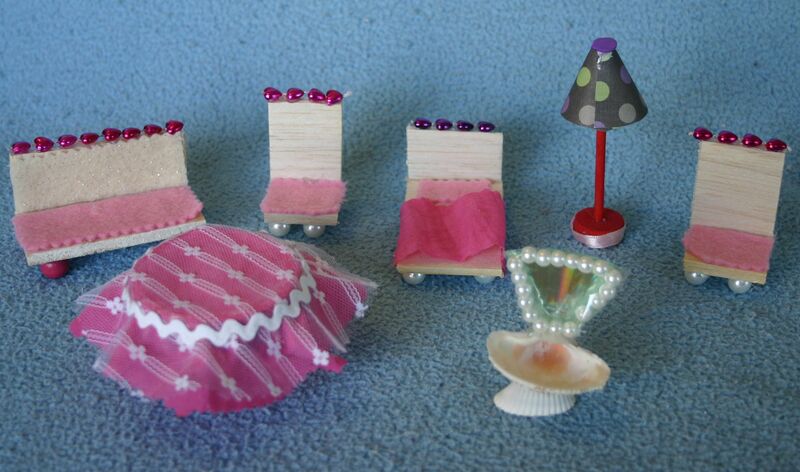 After making our new dolls house furniture and our shoe box dolls houses, we needed some dolls to enjoy them. These examples are cheap and very easy to make and with a few simple materials, you can put together a whole family in a very short time. 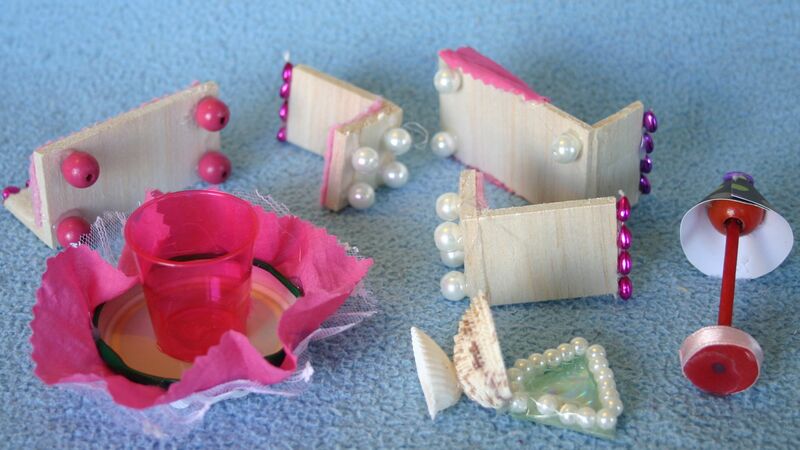 A glue gun really is necessary to ensure that the beads do not slide off again, although you may find a craft glue that would do the job. Cut your extra long pipe cleaner into 2 pieces; with a ratio of approximately one third to two thirds. Bend the smaller piece in half and twist the centre to secure. The centre becomes the neck so leave enough to glue the head onto later. Bend the larger piece in half and slide the neck of the smaller piece through the centre and twist to secure – this should give you a headless pipecleaner man shape (See pipecleaners above.) Give the body a few gentle twists and leave the legs free and open. Decide on your clothing. For men I folded the felt in half and cut wide pants, leaving the top joined with only a small hole to poke the pipecleaner body through. Shirts are made the same way – fold a piece of felt in half and cut the sleeves and shirt shape, leaving the top attached. Bend over to snip a small hole just big enough for the neck of the pipecleaners to stick through. Put the pipe cleaner bodies into your clothes and hot glue them on. Glue on the bead hands, feet and heads. Add hair and any other fashion accessories you desire! I found the idea for the babies here. 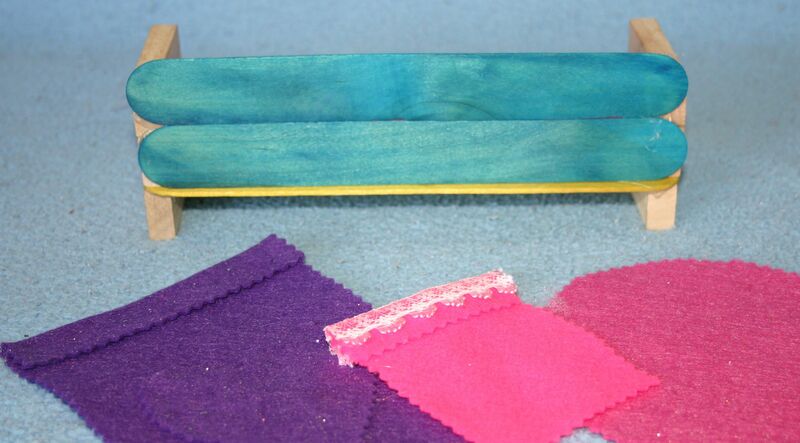 They are made using a similar method, with a small piece of wadding needed to stuff the sleeping bags. The head beads need to be the kind that are only partly drilled – that is the hole does not go all the way through. Otherwise, you will need to give your baby a beanie or something similar to cover the hole! Bend a short piece of pipecleaner in half and twist for the neck. Fold a piece of felt in half and cut the shoulders and sleeping bag shape, leaving the top joined. Cut a small hole to slide the neck of the pipecleaner through. Glue on the head and hand beads and down the sides of the sleeping bag, leaving an opening to stuff it with. Push the stuffing inside and glue the hole shut. Of course, you could sew these if you prefer. You could make the dolls without faces to allow greater imaginative play scope (they are not stuck being “happy” all the time!) but my girls were adamant they wanted faces and in the end I gave in! I find that they are not constrained by the face I have drawn anyway. 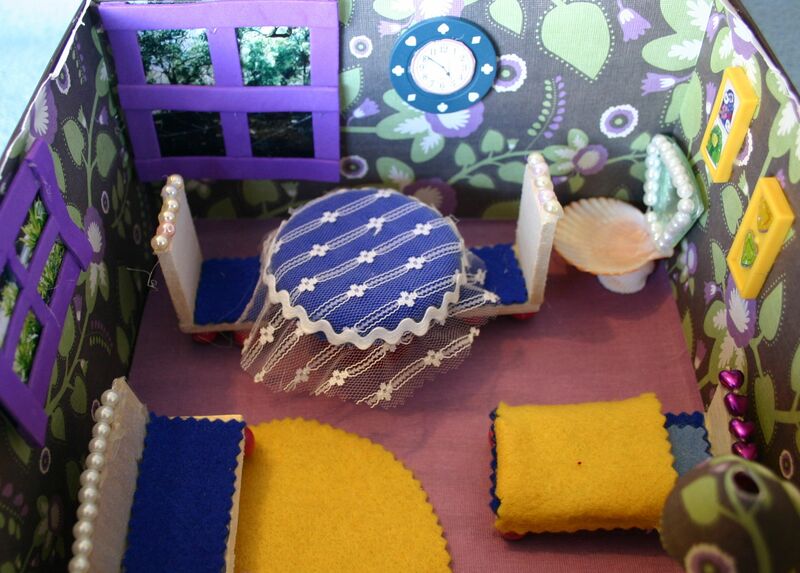 Dolls houses in a shoebox are a wonderful travel activity, take away toy for holidays, table activity, quiet time or room play idea or highchair activity for younger children. They are very portable, simple to make (these examples were created by my 5 1/2 and 8-year-old daughters) and the possibilities for open-ended imaginative play are endless. 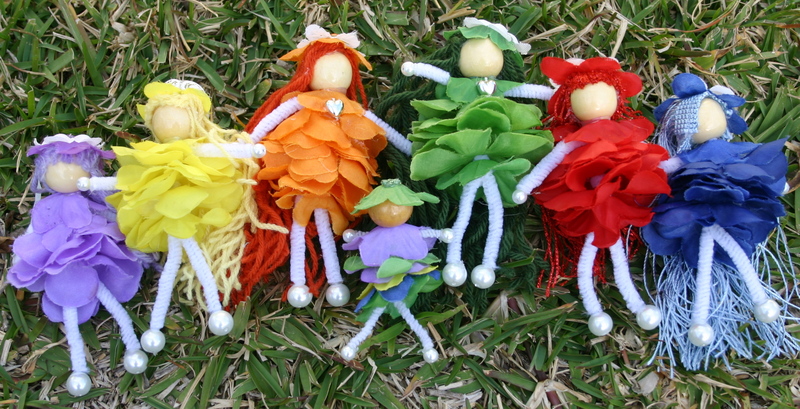 We will be making them with a group of girls for our 8 year old’s birthday party next month and with a little bit of preparation, they will be an easy craft to engage a group of young ladies for a couple of hours. 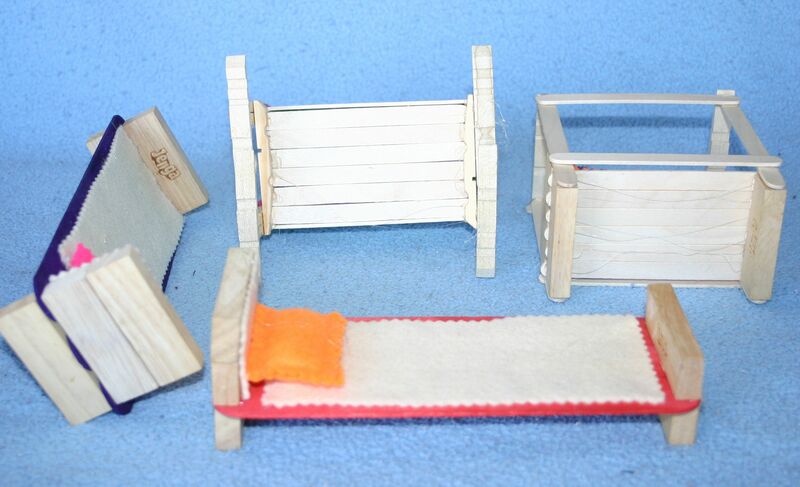 I will be adding some miniature food (novelty erasers from a discount variety store) plus a couple of ceramic ornaments to use in their little houses and the girls will create the furniture, make wooden peg doll babies (instructions in my next post) and decorate their rooms. 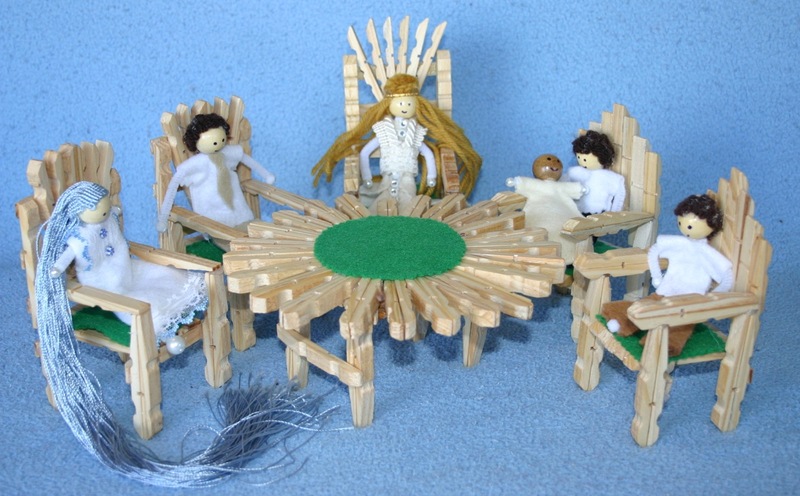 The furniture is made from balsa wood hot glued together with beads for legs and felt pieces for cushions. We cut up cheap plastic bead necklaces to decorate the top of the chairs. A jar lid glued to a plastic shot glass and covered with a circle of fabric and ribbon forms the table. The mirror is a piece of CD surrounded by beads and glued to two shells as the base. The lamp is a small craft stick with a large wooden bead on top and a circle of card cut to form the lamp shade. It stands in a wooden circle that came with the sticks. A printed clock face glued to a plastic disk, plus some old tiles from a board game with miniature photos inside, decorate the walls. Photos and magazine pictures of outdoor scenes give our rooms a view. The girls were able to wall-paper and “carpet” their boxes, plus put together all the contents in a couple of hours and with a little more preparation our party guests should be able to complete theirs in an hour and a half. Lots of fun for all ages and a lovely gift for any little girl. 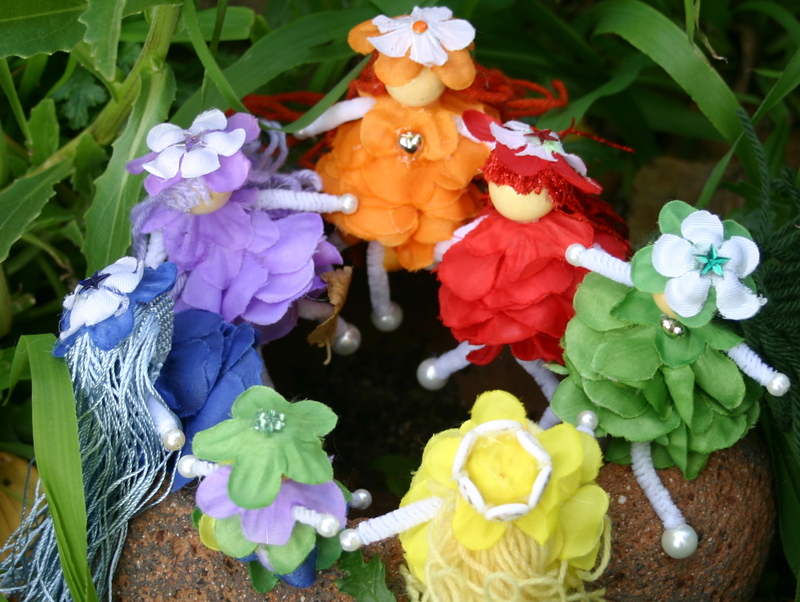 My next post (still to come) on simple peg dolls from pipecleaners and wooden beads. 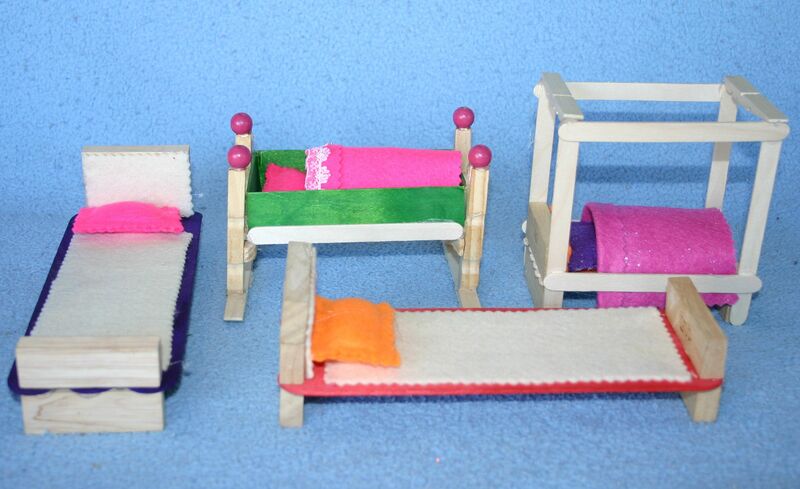 I have had a great time creating a set of wooden clothes-peg furniture for a child’s dolls house this week. 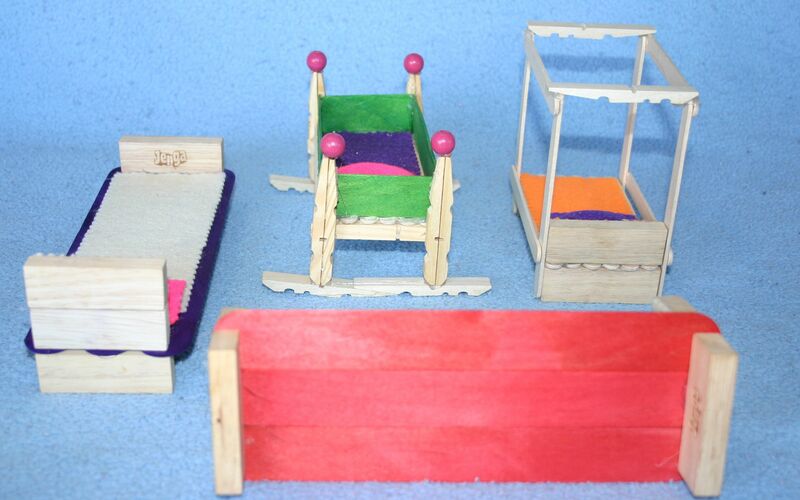 After searching the web for designs I combined pegs, popsicle sticks (coffee stirrers), large popsticks (tongue depressors), wooden blocks from a Jenga game and some colourful felt to create the furniture in these pictures. A hot glue gun made the job super fast and my 10-year-old son even made the table and helped with a couple of the other items. I have included back and side view photos to make it easier to copy the designs if you would like to. Two pictures I used for the designs are here and here. Felt doesn’t fray so I just cut the edges with pinking shears to make it look nice and glued it on as cushions and mattresses, plus a couple of extra blankets for the beds and rugs for the floor. The cot (below) was the only piece that required any cutting for the green edges. A Stanley knife did the job but I wouldn’t want to cut a lot that way. A mini hacksaw or something similar would be better if you plan to cut a lot. My designs specifically revolved around not having to do any trimming to make them quick and easy. Hot glue guns are not very forgiving so some of the furniture is a little wonky! White wood glue would probably be better but I was after speed and convenience! I’ll be posting in the next little while about how to make a dolls house in a box, as well as how to make a family of peg dolls. I’d love to hear your ideas – I could always add on to the set!